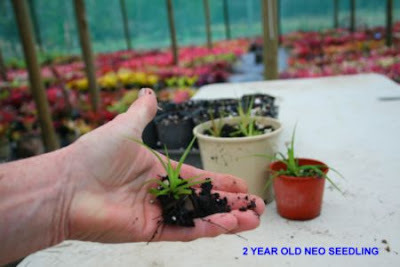 **The above picture shows some Neoregelia hybrid seedlings, though often very slow growing initially, growth can be sped up by the use of liquid fertilizers & long periods of light. Some growers use special lighting at night to achieve optimal growth but these in photo are grown more naturally. 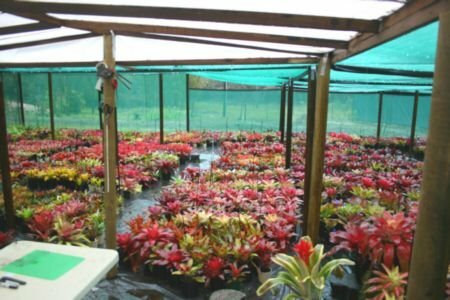 Potting Bare rooted Young Bromeliad Plants. Whether you potting home grown or newly purchased plants, the most important factor to remember is that the mixture be very free draining. A good open chunky mixture containing composted pine bark is ideal but if this is not available, a good orchid mix is ideal, providing it does not contain added fertilizer. Bromeliads I have found really enjoy feeding on organic matter. Pine bark type mixtures are best well composted before use. 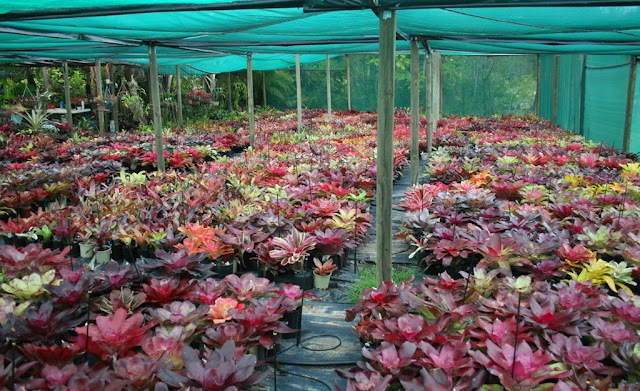 Many commercial potting mixes are fine for growing bromeliads but again check for added fertilizers & good drainage. 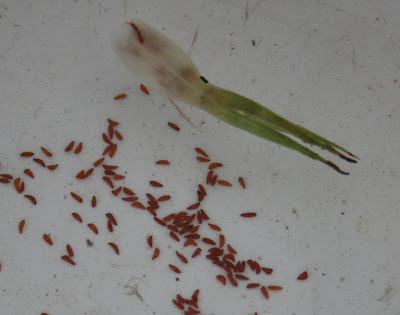 Fertilizer [a subject on its own] is best added at your own discretion carefully as overfeeding [Neoregelias in particular] can cause loss of color. However, when potting up, it is quite safe & beneficial to add [approx 1-2 teaspoons per 10ltr bucket] of sulfate of potash to your potting mix. Potash is great for color & has anti fungal properties. Calcium is also a great additive to potting mixes. A good way to provide this is by adding pre-dried crushed eggshells to your mix. 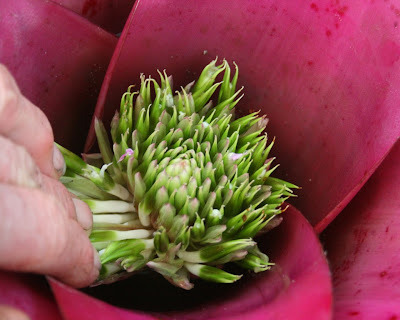 See also other links to Bromeliad growing. Growing Neoregelias from seed can be fun and very rewarding. 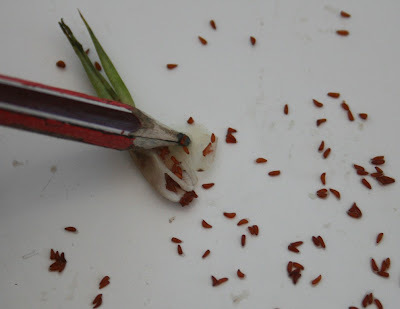 Here are some basic tips on seed collection and preparing fresh seed for planting. 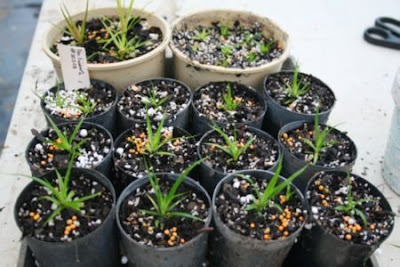 It should be however noted that these seedlings in most cases will not reflect the true characteristics of the parent plant. 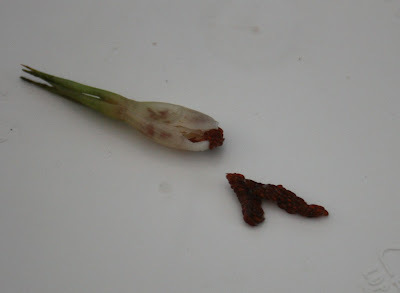 If you have a few plants within your collection and your Neoregelia has set seed your plant will have more than likely cross pollinated with a quite different plant. In order to control these crosses you would need to carefully take pollen from one plant to another and isolate your plants to prevent stray pollen from being transferred by insects and birds. In this case you can get similarities from either parent plant and the outcome is variable. Even with the best of parent plants you will still end up with some undesirable plants. A miracle or a mud pie...destined for the bin. Not all Neoregelia set seed but here are a few photos to show you what they look like when they do. The plant shown here has recently flowered - the seeds are starting to become plump soft and ripe. Place seed in a glass jar or similar and carefully rinse off changing water several times. Take care not to let them escape down the sink...muslin or similar over the top of the jar or similar may help, fastened with a rubber band. 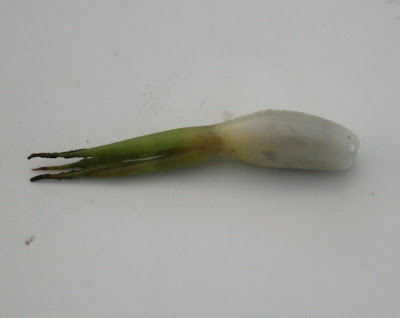 Allow to dry on a paper towel for 24 hours or so [optional] and plant as soon as possible. Sift your mix through a wire stainer so it is nice + fine. Useful mixes can be made up of various additives, fine pine bark, crushed charcoal, Perlite, river sand or a good seed raising mix with no added fertilizer. It is essential the mix is very free draining. Place in oven on a tray until very hot to sterilize the mix. Once Cool, fill some plastic containers with lids For example; Takeaway food trays or sandwich containers. Moisten the mix and lightly sprinkle seed over the top and close it. 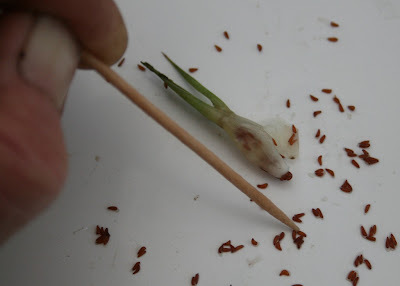 You should not need to water the seed until germination takes place in 1 to 6 weeks. Label the container with date and details of parent/s plants. Seed are best sown in the warmer months. 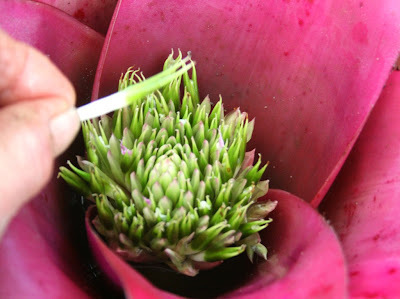 As soon as your new Neoregelia seeds germinate, remove lid and begin to mist them when needed. Mist with liquid fertilizer weekly, starting at 1/2 strength initially and gradually increasing to full strength. This will get your new plants off to a flying start. When plants are a manageable size they can be re-potted into community pots initially and later larger pots. During their growth young Neoregelia will remain relatively green due to the regular feeding. It will take some time before plants color sufficiently for you to know which ones are worthwhile keeping to growing on. 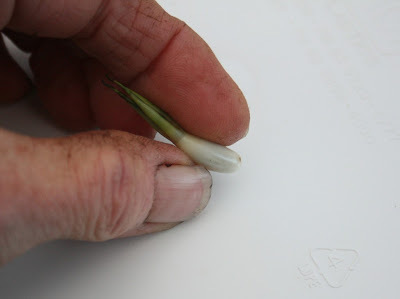 ***MATURING PLANTS Growing from seed can be very time consuming. Plants are very slow and variable. Seedlings can take up to 4 years or longer before you know exactly what you have and if worth keeping. This is the reason why, mostly plants are grown from offsets or pups to produce plants almost identical to the parent plant. 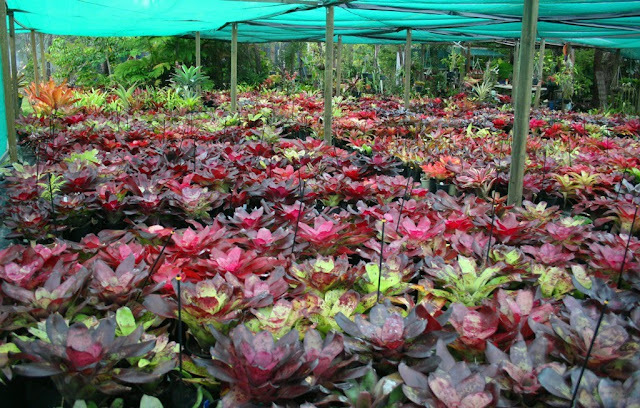 However, raising your own seedlings allow for New Hybrids to be created and some really rewarding exotic plants can be produced this way..
***CAREFUL SELECTION when choosing the parent plants/s and selecting good strong characteristics in a plant to breed from, will greatly increase your chances of producing better offspring and thus reduce the inevitable number of unwanted plants. 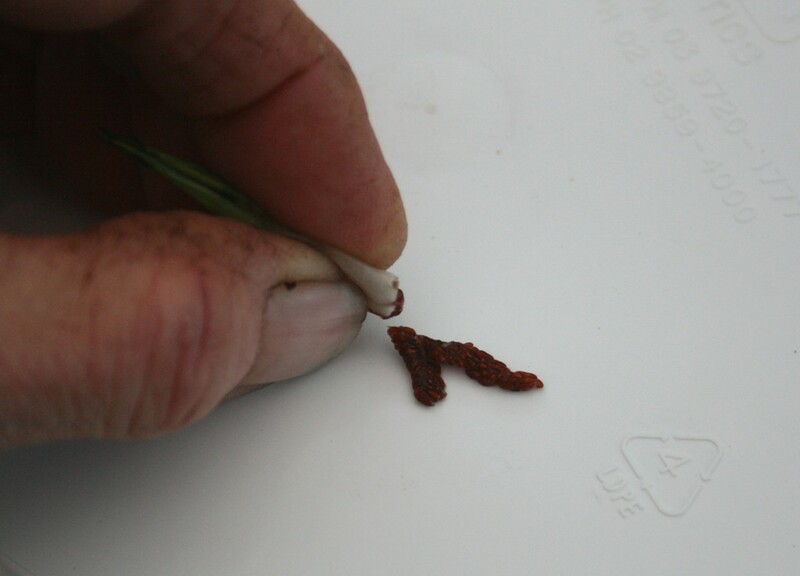 Although this is a time consuming but rewarding adventure- it does perhaps help explain why *New Releases + hybrids are initially very expensive and in limited supply until good stocks of these new plants are established from the following generations of offsets or pups. But you just never know...you, may be the one to produce that next exotic beauty! 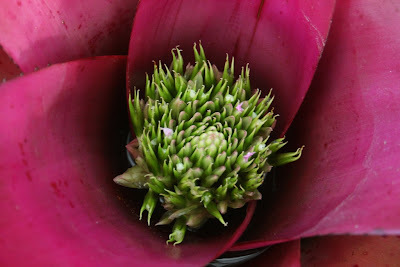 Beautiful Bromeliads on the sidebar menu at the top of this page.